Fresh Mess: where healthy minds and bodies meet over good food. 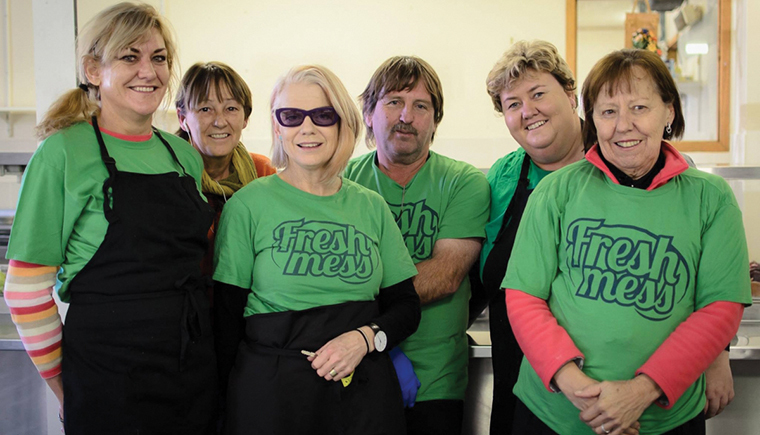 Fresh Mess was developed by staff at Richmond Fellowship, ACT. It addressed both the poor health outcomes and reduced life expectancy of those in the Canberra community living with enduring mental health issues with complex needs. Argyle participated in the program by providing the venue at Ainslie Village. We also volunteered our services every Sunday and ensured the tenants of Ainslie Village had access. Fresh Mess sought to redress the issues of social isolation and poor training opportunities of the target group through the use of a co-operative membership model. Members paid an annual $10 subscription fee and were encouraged to regularly volunteer at the Mess in exchange for a weekly bag of fruit, vegetables, eggs and dairy. Membership also entitled people to sign up for a free certificated food preparation and handling course. This course was run by a qualified Dietician through OzHarvest Canberra. Access to garden mentoring and on site garden training was also provided through partnerships with Canberra City Farm and the Canberra Organic Growers Society (COGS). The Fresh Mess project operated at Argyle’s Ainslie Village site on Sundays from April 2015 through to March 2016, until funding was depleted. During this time there were more than 170 Co-Op members, with an average of 40 members turning up each Sunday to participate in the Fresh Mess community. While Fresh Mess was unable to secure ongoing funding, which would have provided for essential additional project staff, it was a great testament to the spirit and capacity of the model that it continued with a small base of volunteers from the mainstream community. Ultimately and overwhelmingly, it thrived as the direct result of the passionate commitment of its membership.